Fireworks and Flame – Science is Fun! For me, July means fireworks on the 4th and candles for my birthday. What do these have in common? You can use a match to light both but it turns out they both come in a variety of brilliant colors as well. I recently found Colorflame birthday candles and love using them on everyone’s birthday cake. The candles burn with 5 different colored flames. The candles use the same science that give fireworks their color – adding salt to the wick – or in the case of fireworks the explosive black powder. I first wrote about this in the “Crime Scene Science Fair Experiments” book. It is actually fairly simple to create colored flames in your own kitchen or fireplace. To understand how these chemicals produce different color flames, you first need to look at how an atom works. Every atom has a nucleus, made of protons and neutrons, surrounded by electrons. We are mainly worried about the electrons in this case. Different atoms, like sodium or potassium, have different numbers of electrons. These electrons spin and move about the nucleus very, very fast (faster than you could even imagine, much less see) and the electrons have different, but very specific, energy levels like steps on a staircase. When an atom gains energy from heat or light the electrons will jump up to a higher step. Eventually these electrons have to come back down to their original energy level and when they do, they give up the energy in the form of light. The color of the light depends on how big a step the electron took. Red, orange and yellow have less energy than green, blue and violet. The size of the steps, and therefore the color given off, depends on the atom. This is why sodium gives off a bright orange-yellow color and potassium produces a violet flame. So how can you make colored flames at home? You can use salts that contain the metals which release light energy as described above. To give the electrons in the metals energy we will add heat by heating them in a flame. * Check the labels of these products to make sure they contain the chemical listed here. First pour some rubbing alcohol in a cup and soak one end of a cotton swab. Light the candle and quickly pass the alcohol swab through the flame so that it catches fire like a tiny torch. Look carefully at the colors. Is the top the same color as the bottom? Blow out the flame before the cotton starts to burn. A cup of water will be handy for dowsing all your torches – just don’t get it mixed up with the alcohol cup!! This time dissolve 1 tablespoon of table salt in a tablespoon of alcohol and repeat the process. How are the colors different? Try the other salts on the list. Some of the salts contain the same metals like plaster of paris and the de-icer. Did the calcium in these chemicals produce similar flames? If you want to take it one step further and show exactly how these colors are different you can build a spectrometer. 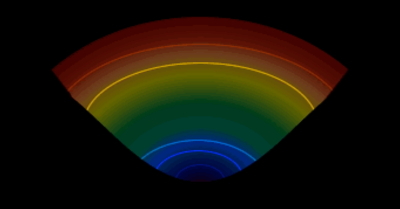 A spectrometer separates the colors in light, kind of like a rainbow, so that you can see specifically which colors are brightest in the frame. The directions here are copied straight from my book and just use a shoe box and old CD. You will be able to see something that looks like this. ← Adding Color is Tops!